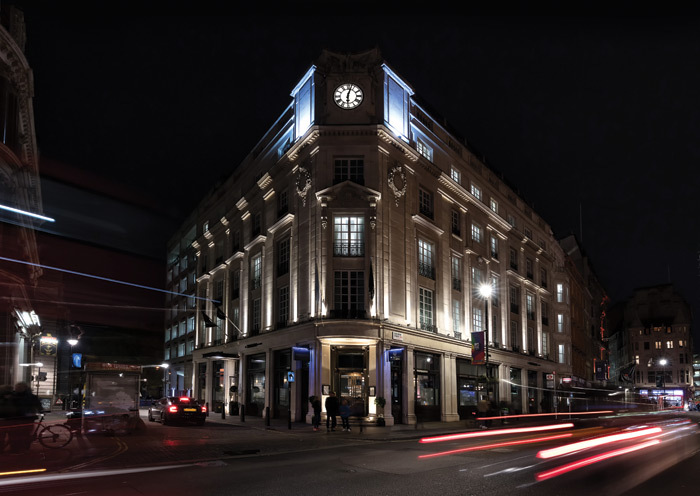 The Trafalgar St James hotel has undergone major renovation, with SHH Architecture & Interior Design taking the role of lead architect. The hotel was refurbished with a nod to the building’s history and its iconic surroundings. On the south-west side of Trafalgar Square, the hotel is part of the Curio Collection by Hilton, the hospitality giant’s portfolio of unique, upscale hotels. In addition to working on guest rooms and connecting corridors, SHH was tasked with creating The Rooftop, the hotel’s roof terrace bar, while the full design team on the project also included design studio AvroKO, commissioned to redesign the lobby, the lower lobby and the all-day restaurant The Trafalgar Dining Rooms. A challenge for SHH was creating something that would go beyond the ‘tourist destination’ feel of St James and the West End in general, by turning the hotel into a ‘sanctuary of style’. 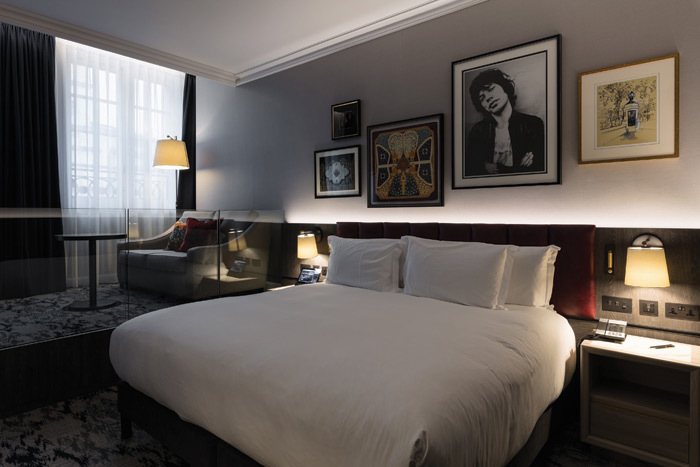 ‘We didn’t want it to feel like a mainstream chain hotel, because it’s not, so the key was staying true to the independent ethos, as well as creating a distinctly London aesthetic,’ says SHH creative director and founder Neil Hogan. Nonetheless, his studio wanted the hotel identity to reflect its famous location. ‘We tailored the accessories so they were London and British-centric,’ says Georgia Stevenson, senior interior designer at SHH. The 131 guest rooms, including 15 suites, were updated with bold colours and tactile furnishings to inspire comfort, while maintaining art-deco influences and references to the history of the building. Once the location of the Cunard Steamship Company’s offices, this is the site where the news of Titanic’s sinking first broke. A distinct palette of blues and warm, deep reds is used throughout the hotel. ‘We wanted the space to be engaging and comfortable. The scheme is bold and inviting and the colours chosen are uniquely British. As a guest, you’ll see a lot of deep blues with highlights of red and burgundy,’ says Hogan. 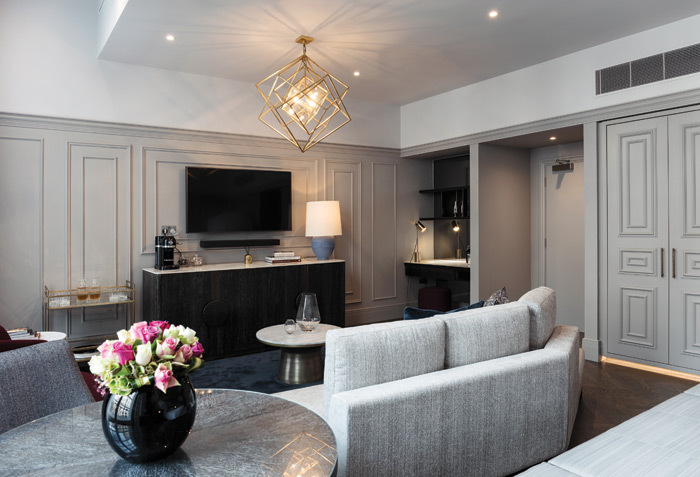 All of the rooms follow the same theme, though the suites have a more muted colour palette and have bonus features, such as real stone in bathrooms and additional custom furniture, Stevenson adds. Working with a variety of British and international designers and manufacturers, the SHH team carefully sourced and selected bespoke pieces to create an exclusive atmosphere. British carpet brand Brintons, founded in 1783, produced the Axminster carpet used throughout the guest rooms. The blue-and-white carpet ties in with the red headboards in the rooms, continuing the subtle Union Jack theme. Meanwhile, carpeting in the corridors has been inspired by the star pattern of one of Lord Nelson’s medals, celebrating the iconic location of the hotel and Nelson’s column in the middle of Trafalgar Square. Glasgow-based textile designer Timorous Beasties’ scatter cushions in luxurious crimson velvet with a black-and-gold bee print are used throughout the rooms as statement pieces. Bespoke artwork for the guest rooms, featuring both Trafalgar Square and well-known Britons, were created by Peter Millard & Partners. During the redesign, the main challenge for SHH was working with the existing building infrastructure. ‘Few rooms were exactly the same and each room had its own quirkiness. In particular, the windows would vary from room to room so the window treatments had to be amended to suit – with more than 100 rooms that can prove a challenging and lengthy process,’ Stevenson explains. 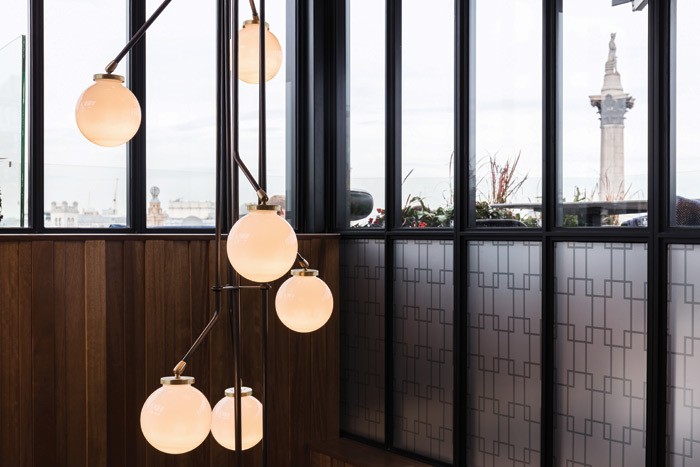 British luxury lighting manufacturer CTO Lighting was chosen by SHH to create a bespoke chandelier, taking inspiration from its own Array Opal range. Measuring more than 2.5m deep, it is the first thing seen when entering The Rooftop bar from the lift. Part of SHH’s brief was designing The Rooftop, a destination bar and dining space at the very top of the hotel, making the most of the view of Trafalgar Square. 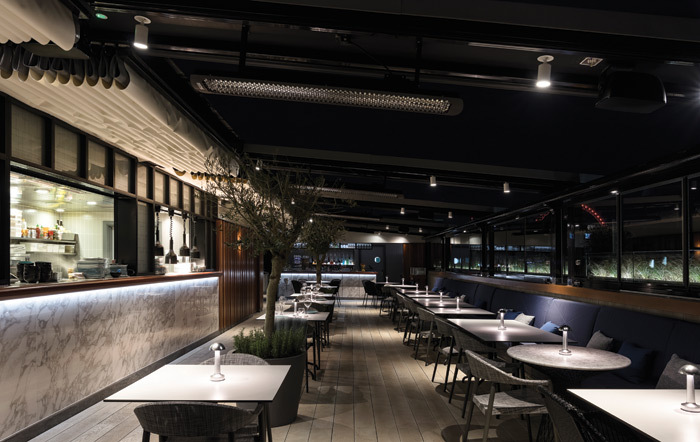 Another challenge was to weatherproof the terrace to suit Britain’s unpredictable climate, and so a retractable canopy and a heated space were added. ‘We created distinct indoor and outdoor zones to cater to multiple uses, including a glass house for private events. The Rooftop is all about the stunning, uninterrupted views so we worked to maximise these,’ says Hogan.